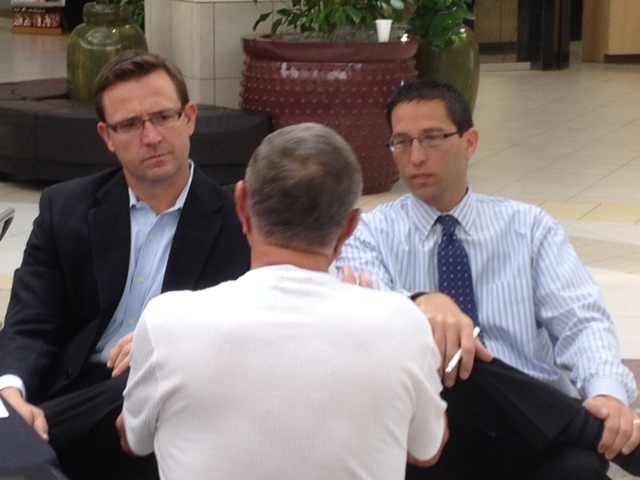 Ty Roland and Evan Lubell, partners in the law firm, Aloia, Roland and Lubell, LLP provided free legal consultations and advice in the areas of real estate, BP Oil Spill claims, and commercial litigation at the Lee County Bar Association’s Annual Law in the Mall event, held at the Edison Mall on Saturday, April 27, 2013. Almost 100 residents attended this year’s event. “We were happy to be able to serve our community in need who otherwise would not be able to afford these legal consultations,” states Ty Roland, Partner at Aloia, Roland and Lubell, LLP. Aloia, Roland & Lubell, LLP serves clients throughout Southwest Florida in business and commercial litigation. The firm is led by partners Frank Aloia, Jr., Ty Roland and Evan Lubell, an experienced team of attorneys who are committed to providing the highest level of service for their clients. Aloia, Roland & Lubell, LLP has offices at 2254 First Street in Fort Myers, and 1716 Cape Coral Parkway East in Cape Coral. For more information, call 239-791-7950 or 1-855-SWFL-BIZ (855-793-5249) or visit www.floridalegalrights.com.